We've been following Legendary Pictures' Godzilla movie since the first new monster design blew the doors off Comic-Con 2010. But since then, the giant kaiju has been waiting under the sea, ready to strike with more news. And more news we have! 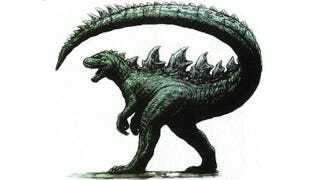 A batch of rejected Godzilla concept art has been leaked, giving us a better idea of what kind of monster the studio is building. This rejected concept art was released in G-fan magazine and has been confirmed to be the real, rejected deal. Monsters director Gareth Edwards is attached to direct this rebooted Godzilla picture. Max Borenstein (The Seventh Son) has been rewriting David Goyer's original draft of the script. As of now, we're getting the feeling that this is all still in the development stages, although we expect a 3D or IMAX announcement at some point. Of all the movies eagerly attaching 3D and IMAX to their title, Godzilla actually seems to fit. Until we know more, we'll just have to settle for this rejected art. What do you think? We certainly like the classic feel to these monster, even though the studio passed on this work.